The view over Cockburn Harbour, South Caicos. The quiet streets of Cockburn Harbour, South Caicos. Cockburn Harbour is main settlement and the centre of activity on South Caicos. It is known as the fishing capital of the Turks and Caicos and is home to two fish processing plants and exporters. As is also the case with Cockburn Town on Grand Turk, Cockburn Harbour was christened after the early 1880s governor of the Bahamas Sir Francis Cockburn. Nearly all private residences on South Caicos are found in the Cockburn Harbour region. 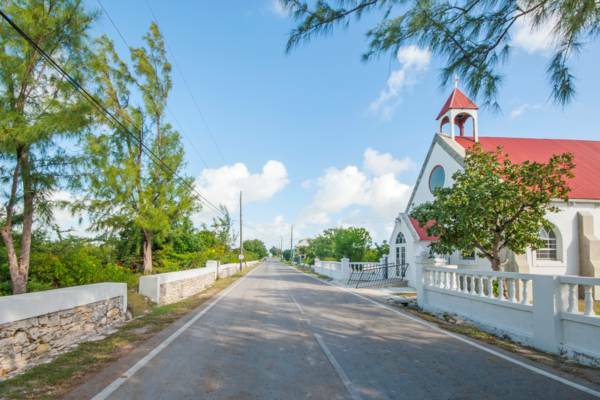 The settlement is well-contained, and divided into small blocks by a pattern of paved roads, a layout uncommon to the Turks and Caicos. Two hotels are located south of Cockburn Town on the southern coast. The view of Admiral Cockburn Land and Sea National Park from Government Hill. 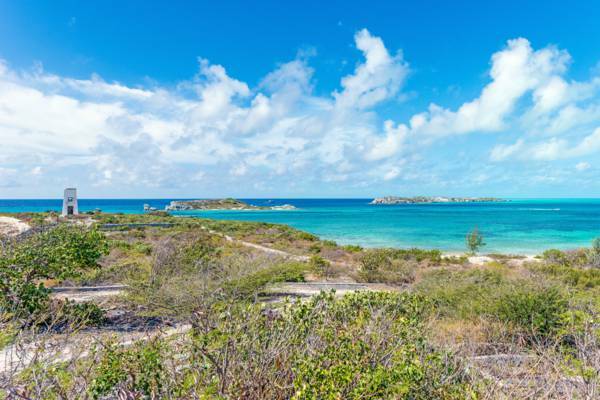 From the high ground of Government Hill on the southwest of the town, a truly spectacular view can be had south over Long Cay and Dove Cay in the Admiral Cockburn Land and Sea National Park. To the north is likewise interesting. The abandoned infrastructure from the salt industry can be seen extending for miles on the salinas. Also situated on this hill is The Residency, the disused British colonial home of a former district commissioner. In 1966, Queen Elizabeth and the Duke of Edinburgh visited South Caicos on the Royal Yacht Britannia. Donkey races and sloop sailing were the day’s activities. To commemorate the visit of the Queen, the annual South Caicos Regatta sloop race has been held ever since in the sheltered waters off of Conch Ground. Old salt warehouse at Cockburn Harbour. 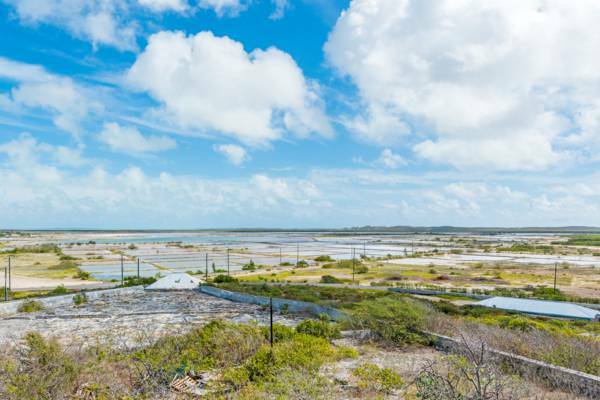 The centre of South Caicos consists of shallow marine pond, a natural resource that proved to be quite valuable for sea salt production. At the height of the salt industry, South Caicos was the major producer of sea salt in the Turks and Caicos, exporting more than Grand Turk and Salt Cay combined. After the inevitable collapse of the industry, South Caicos saw some difficult times. 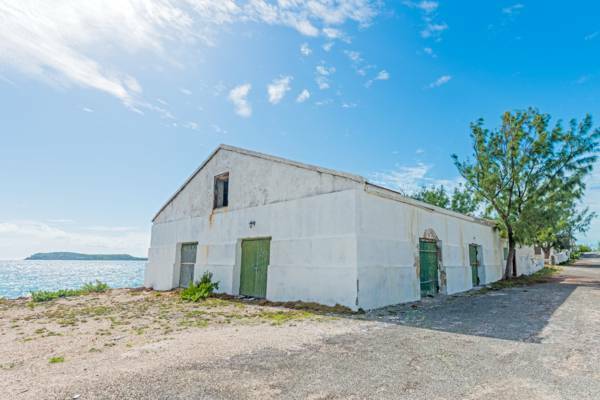 The opening of the U.S. Coast Guard LORAN Station increased outside income a bit to the island, however, the economic prospects are still recovering today. Quite a few beautifully-made cut limestone block warehouse and administration buildings have been in decay since the 1960s. Hurricane Ike in 2008 struck the island severely, with estimates of 80% of the homes on South Caicos and Grand Turk being damaged or destroyed. Hurricane damage also resulted in the closure of the island's sole scuba diving business. Looking over the salinas from the ruins of The Residency.